It's getting tougher and tougher to be a Christian in this culture. And no, I'm not talking about legislation against prayer in schools or the cultural shift toward secularism. I am not talking about any negative pressure or opposition from atheists, scientists, or folks with differing religious persuasions. I'm talking about Christians. This has long been a reality for me--I've long felt alienated from the mainstream of my own faith and I've always found that Christians are the ones who make Christianity so difficult. My most profound crises of faith have come not from the challenges of people outside the Church but from the people inside it who look nothing like Jesus... not just in the fact that they struggle but that their "worldview," for lack of a better term, and their political, economic, and philosophical orientations are so diametrically opposed to those of Jesus (of course I'm speaking from my own perception of Jesus, not to claim any more certainty than what is possible from my own perspective). It's Christians who challenge my faith... Christians who are so distracted by their so-called "moral issues" that they have justified the immorality and blatant counter-biblical-ness of their support of a system which values the rich over the poor, dignifies the citizen over the foreigner, condones the the use of violent coercion and lethal force against it's enemy, and seeks to syncretize its' own religious and patriotic values with those of the Church (and any other local religion other than the dominant religion of American patriotism). 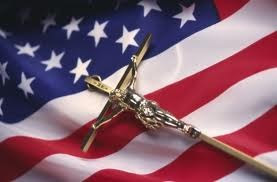 It's Christians who blindly have no problem with seeing the American Flag and the Cross of Christ lifted together on the same pedestal. It's Christians who read the whole bible and miss everything Jesus actually taught--love for enemies, preference for the least and last in society, relentless generosity, forgiveness, and befriending so-called sinners (just to name a few). And, actually, it's not so much those Christians who see Christ so differently and who orient their lives in such a different direction. The most challenging reality is this: I am in the minority! Christianity has come to be associated so much with the polarizing political conservative extremism that it has become typologically definitive. See, it would seem that Christians, even with the most superficial understanding of the bible--perhaps just after a quick first-read through one of the gospels--would be the first to stand up for the rights of others, the most suspicious toward the wealthy, the most preferential to the poor (and most critical of a system which presumes indignity toward them), the last to support or condone war and violence, the most hopeful about the future, and the most gracious in disagreement. But the opposite is true. Christianity in America has become the antithesis of the Christianity of the New Testament (sure, I exaggerate... but get my point). THAT is what causes me to doubt, to question, to ask myself whether or not this is all worth the effort. That is the biggest challenge to my faith and indeed it is also the largest challenge the church must face in the future. The Church must ask, after so many have called us to see this, how we will realign ourselves with Jesus, with the least of these, and how we will free ourselves from the monster we have created. We are our own worst enemy. Christianity is its own worst enemy. My favorite bumper sticker: Dear God, Save me from your followers! I recommend a small book by Lee Camp called Mere Discipleship. The book opens with a look at the genocide of Rwanda and notes that at that time, Rwanda was designated "the most Christian nation on earth". American Christianity had been exported to that land and they murdered each other by the tens of thousands! Wow! Camp goes on to analyse most the the kinds of issues you raise here after the school of J.H. Yoder. And he coins a term, somehting like Constantinian Cataract. Basically, the Christianity you complain of there (rightfully in my opinion) is the brand that comes from Italy in the 300's under the Emperor Constantine. I am no church historian, and the book does not dwell on church history, but it takes a few lessons of history and looks at the American church with blunt analyisis. I suspect it will give you hope to know that others are seeing this problem too. There are efforts made to draw attention and help to the problem. Thanks so much for the book recommendation. I'm gonna check it out! I have strong disagreement with the conclusions at the end, but I find the analysis of the problems and the complexities of culture etc in the first half to be flat out apocalyptic!